Each student’s grade in Competency-Based Mathematics will be an average of their highest examination scores for each test on the software. If a student fails to complete one or more of the assigned tests and does not withdraw from the class, they will receive a grade of F on their Truman transcript. 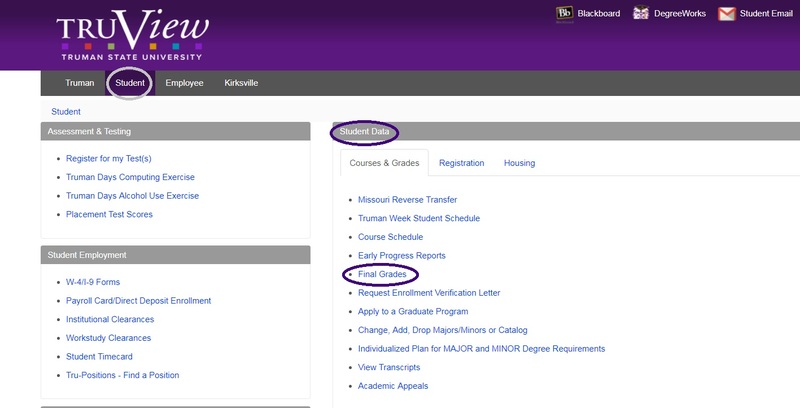 Competency-Based Mathematics students can view the grade they received by logging in to Truview, selecting the Student Tab, and clicking the “Final Grades” link in the “Student Data” box under the “Courses & Grades” heading. If students are enrolled in an associated high school class (Model 1), high school grades are assigned by the high school teachers at their discretion. Since most high school classes do not conform to the schedule of a normal college semester, grade entry may be required for Truman students before your semester has ended. Thus, Truman will record a grade of NS (not submitted) until the point at which the students final grade is submitted. Additionally, the Competency-Based Mathematics program permits students to continue to work beyond the completion of the normal Truman class term–up to one semester–at the discretion of the proctor. Students from contract schools who anticipate completing after the school year has ended must have their teacher or counselor contact the Truman Institute to make special arrangements. Because teachers are generally not available during the summer months, however, pursuit of this option is strongly discouraged. Grades earned in Competency-Based Mathematics courses will affect the university gpa of students who later choose to attend Truman. Each student that signs up for a Competency-Based Mathematics course will have a Truman transcript that lists the course they signed up for and the grade they earned – just like a regular Truman student. Unofficial Transcripts: Students can view and print their unofficial transcripts by logging in to TruView, selecting the Student tab, and clicking the “View Transcripts” link in the “Student Data” box under the “Courses & Grades” heading. Note: Students who have not paid their account balance in full or submitted an accurate social security number to Truman will have a hold placed on their account that will prevent them from being able to send their transcript until their balance is paid. Students who complete a Competency-Based Mathematics Course with a grade of C or higher can transfer the credit to any school that accepts Truman State University credit. To determine whether or not a certain school will accept transfer credit for these courses contact the registrars office at the school and provide them with the course description (see below). All colleges and universities in the State of Missouri that participate in “Core 42” must accept this credit. A student’s Truman course grades may or may not be included in their gpa at another college or university when transferred depending on the school’s transfer policies.